This section is used to configure the main settings of the VegetationSystem Component. It is here you set up references to camera, terrain. Add Vegetation Packages etc. When enabled VegetationSystem component will use Terrain.ActiveTerrain as selected terrain. Disable to provide a terrain manually. For setups with multiple terrains and VegetationSystems this is needed. When enabled VegetationSystem component will use Camera.Main (Camera tagged as MainCamera) as selected camera. Disable to provide a camera manually. For setups with multiple cameras this could be needed. Run time created cameras will be detected if tagged as MainCamera. This drop down box selects the active vegetation package. The active packages is the one you configure and use with this component. Select from drop down list or set index from script to change. 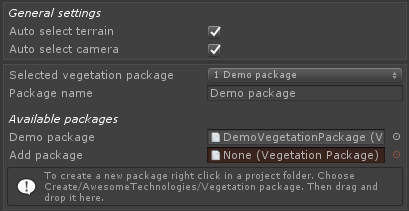 This is a list of all vegetation packages added to the VegetationSystem Component. To remove, select one and press Backspace key. To add a new package to the vegetation system drag and drop in the Add Package drop field. These settings are helper setting to configure the Unity terrain. With all vegetation in Vegetation Studio there is no need to have the tree or detail system on Unity Terrain enabled. Enable this to turn of unity terrain detail system at startup. Enable this to turn of unity terrain tree system at startup. With this setting enabled VegetationSystem will make sure the Pixel Error on the Unity terrain is at least 5. A really low pixel error will lead to a high amount of drawcalls for the terrain. Load terrain details needs to be enabled in order to use Terrain Detail density rules for spawning. Disabled by default to save memory. This sets the sea level for the selected terrain. Value is in meters from terrain 0 height. This water level will be used as 0 height for spawning rules in Vegetation Tab and for splat map generation in TerrainSystem component. for terrains with large areas of sea and no under water vegetation you can enable this setting. it will exclude the sea level(or lower) cells and speed up culling and spawning as they do not need to be evaluated. If you would like to override the vegetation cell size, enable this and set the new size. This setting will proably be removed after Beta. 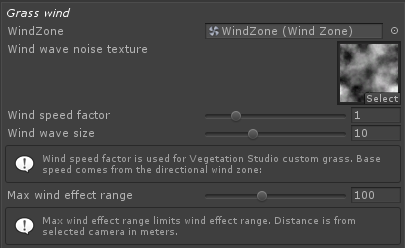 VegetationSystem component will search and select the first directional Wind Zone it finds in the scene. If you have multiple and want to select what zone to use, drag and drop it here. If no wind zone is present there will be no wind for Vegetation Studio Grass. Noise texture is used to calculate wind waves for Vegetation Studio Grass. It should be tilable to aboid artifacts in the wind movement. Wind speed factor is a multiplier for the wind speed on the selected wind zone. This sets the scale in meters for the noise texture used to create wind waves. Checkbox to enable or disable wind effect range limit. When disabled wind will be active until max visible range. This setting sets the maximum range from camera for wind to affect grass.